A paraglider is a free flying, foot launched aircraft. 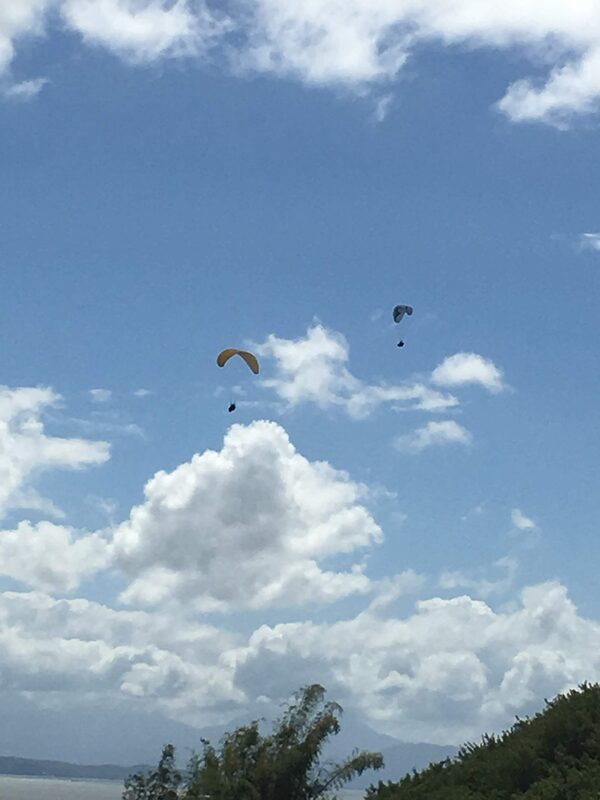 A tandem paraglider is specifically designed to carry two people. The passenger is strapped into a harness in front of the experienced pilot. 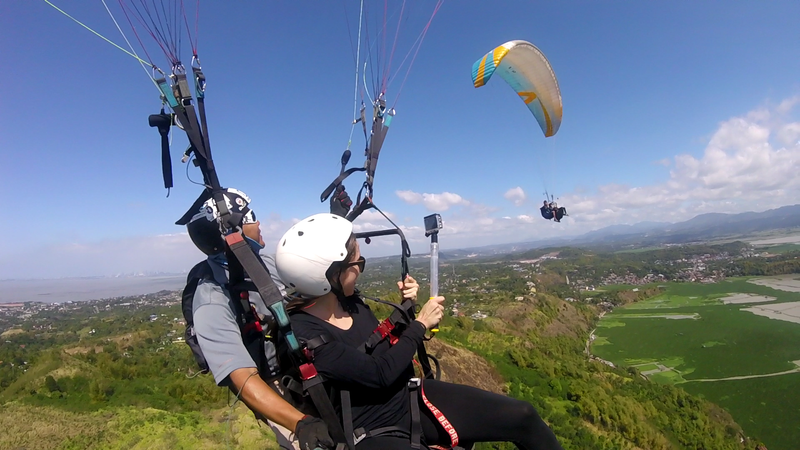 Don’t confuse paragliding with skydiving, you will not be jumping out of a airplane. Paragliding is an extreme sport, but you are in good hands with our pilots. 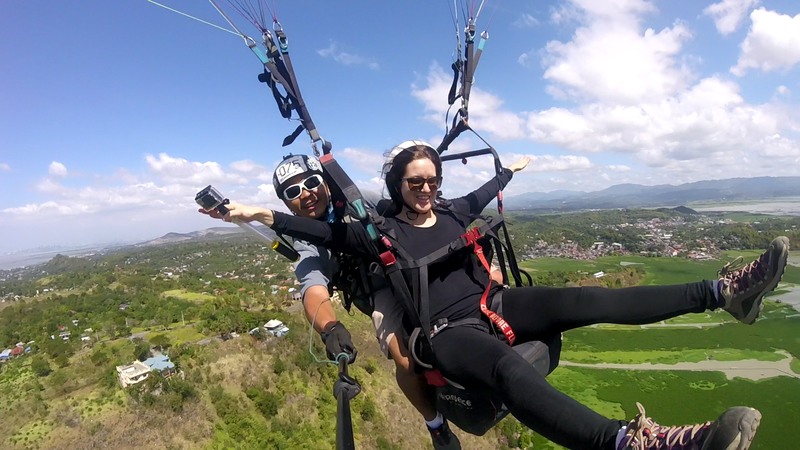 All tandem pilots are highly experienced certified by PPHGA(Philippines Paragliding Hanggliding Association) with insurance. Our pilots will only fly in weather that is safe. If other pilots are flying but pilot does not feel it is safe to fly, he will not let his pilots fly, we would rather schedule you for another day. Safety is key. Take offs and landings are safe and easy. 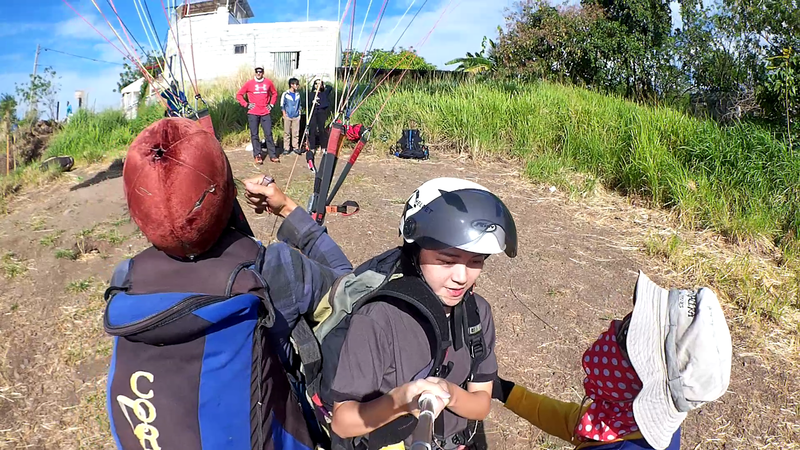 Your paragliding pilot will brief you on take off and landing procedures before your flight. It is important that you trust your pilot and listen carefully to what he has to say. Take off requires a few steps, once airborne you will be instructed to sit comfortably in your harness. 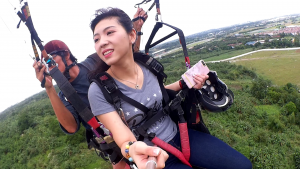 Landings are on a specific area of grass or beach sand and require that you stand up in the harness and take a few steps as you touch the ground. You are welcome to use your own camera as long as you hold tight and your insurance policy is up to date, we cannot be held responsible for your camera being dropped a few hundred metres while we are doing a wing over with you. Friends and family are welcome to take photos during take off and landing. Your pilot will have a camera that is tightly strapped to his harness during the flight, you can rent pilot’s GoPro. Usually pilot support you to get better angle and view. How many people can fly at the same time? We can arrange up to 5 pilots per group, so yes you and your loved one, friends or family can all fly at the same time. This does not mean that you will all be flying in the same paraglider, might sound like a stupid answer but we have been asked “how many people can fly in that thing at the same time”, it is a tandem paraglider which means two people. Do you give discounts for group bookings? Yes for groups of five people or more. Please enquire with us when you are making your booking. Please note that 10% discount and 50% deposit is required for a group booking. If you have paid in advance and we can’t fly due to weather conditions we will reschedule it. And no extra charge within 3 months. If things happened again, we happily refund all deposited amount on your request. What time to fly? How long do you fly? The best time to fly is often in the morning from 7~12am and 3~5pm. To give everyone the best chance to do the tandem flight it is important to be at the meeting point at the scheduled time with advance booking. Best to plan for a half day (morning). The actual flight takes 10-15 min. 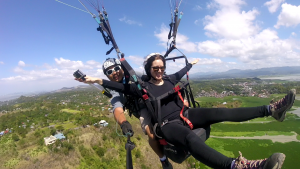 You can book a longer flight of 20-40 min for advance tandem flying course. Expect hot and sunny weather. BRING ENOUGH WATER WITH YOU! Polyester/trekking pants (shorts, not really recommended due to the sharp grasses). Any dry fit (or similar material) shirt for comfort. You can also wear leggings. 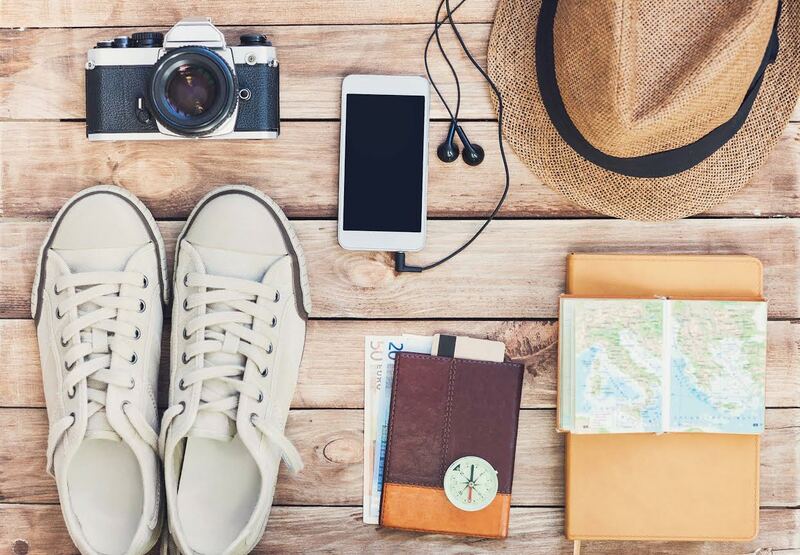 Toiletries: insect repellant, alcohol, wipes. Helmet: Will be provided, but if you prefer to use your own you can bring it with you. Camera or video camera for souvenir shots; GoPro for a fee available.